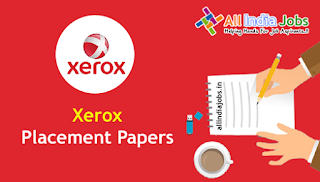 Xerox Placement Papers PDF Download 2017-2018 | Aptitude, Reasoning & Verbal Ability Model Papers. Job seekers who are looking for the Xerox placement papers can access these model placement papers that are similar to the real company placement tests in the past few years. All our mock placement tests are designed carefully so that the pattern of our mock tests, the type of questions featured in them & their level of difficulty are comparable to the actual selection tests conducted by Xerox. We also provide free mock placement papers for each company consists of Aptitude, Reasoning & English tests and we suggest the aspirants should take the result analysis after every test while the preparation for the Xerox Recruitment online written test. Candidates who had a passion to work with the Xerox Company must analyze the capability of getting a good score before attending the Xerox recruitment test. This analysis will help you identify your areas of strengths & weaknesses, provide you to enhance your performance and help you crack the placement tests of Xerox Company. We recommend applicants go through all the company placement papers and also test pattern provided by our official site before attending the written test of Xerox Recruitment test. The written exam conducted by Xerox for selection is moderate to difficult. In this section, you can find the latest placement papers of many different IT companies, core companies and many more. We have recently updated the questions which include the latest placement papers also. All companies placement papers are regularly being updated. Don’t forget to check out the latest placement papers of top companies daily. Check for latest placement papers of all companies such as TCS, Cognizant, Amazon, HCL, Dell, IBM, Google, Samsung, L &T and many more. For more updates bookmark our site All India Jobs. Aptitude test questions and answers for the Xerox company are given below with a detailed solution. Candidates who are preparing hard can practice these questions to get qualify in the written test of Xerox placement test. 1. Two trains, one from Howrah to Patna and the other from Patna to Howrah, start simultaneously. After they meet, the trains reach their destinations after 9 hours and 16 hours respectively. The ratio of their speeds is? Let us name the trains A and B. 4. The weights of three boys are in the ratio 4 : 5 : 6. If the sum of the weights of the heaviest and the lightest boy is 45 kg more than the weight of the third boy, what is the weight of the lightest boy? 5. A man deposited Rs. 400 for 2 years. Rs.550 for 4 years and Rs.1200 for 6 years. He received Rs.1020 as the total simple interest. The rate of interest per annum is? 6. ³√216400 + √280 + √322 = ? 7. Running at a speed of 60km/h a train passed through a 1.5 km long tunnel in 2 min. What is the length of the train? 8. X and Y can do a piece of work in 20 days and 12 days respectively. X started the work alone and then after 4 days Y joined him till the completion of the work. How long did the work last? Now, 2/15 work is done by X and Y in 1 day. So, 4/5 work will be done by X and Y in (15/2 * 4/5) = 6 days. Hence, total time taken = (6 + 4) = 10 days. 9. The height of two right circular cones are in the ratio 1:2 and their perimeters of their bases are in the ratio 3:4, the ratio of their volume is? 11. In how many different ways can the letters of the word ‘CORPORATION’ be arranged so that the vowels always come together? In the word ‘CORPORATION’, we treat the vowels OOAIO as one letter. Number of ways arranging these letters = 7! = 2520.
in 5! = 20 ways. 14. Six bells commence tolling together and toll at intervals of 2, 4, 6, 8 10 and 12 seconds respectively. In 30 minutes, how many times do they toll together? 15. 1397 x 1397 = ? In this page, applicants can have a look for the reasoning test questions and answers and prepare well for the written test of Xerox recruitment test. We suggest the aspirants work hard to give the best result in the examination. 3. Gardener : Trowel :: Seamstress : ? Second is the tool used by the first. 4. On what does Quinn rely in making her argument? 5. Here are some numbers translated from an artificial language 743 means Mangoes are good 657 means Eat good food 934 means Mangoes are rip Which digit means ripe in that language? 6. Assertion (A) : A little gap is left between iron rails. Reason (R) : Iron expands in summer. 7. Pointing to a boy in the photograph Reena said, “He is the only son of the only child of my grandfather.” How Reena is related to that boy? The parents’ protest against high fees being charged by the institutions led the government to interfere and fix the fees at a more affordable level. All except Mathura are cities situated on the banks of Ganga river. 10. In a certain code language, if the word MISTERY is coded as ZLFGREL, then how is the word PURSUE coded in that language ? Word : M Y S T E R Y Pattern : To each of these letters their corresponding letters from the other half is given. Code : Z L F G R E L Similarly, the code for PURSUE is CHEFHR. 11. Reva: Using extraneous incentives to get teenagers to change their attitude toward school and schoolwork wonít work. Take the program in West Virginia, for instance, where they tried to reduce their dropout rate by revoking the driving licenses of kids who left school. The program failed miserably. 12. What will be the total weight of 10 poles each of the same weight? I. One-fourth of the weight of a pole is 5 kilometers. II. The total weight of three poles is 20 kilometers more than the total weight of two poles. 13. Shamika Gupta is a Science graduate passed in 2006 with 47% at the age of 22 years. She had scored 64% marks in HSC. She has also passed M.Sc. with 58% marks. She has done a certificate course in computers. 14. A girl leaves from her home. She first walks 30 m in the North-west direction and then 30 m in South-west direction. Next, she walks 30 m in South-east direction. Finally, she turns towards her house. In which direction is she moving? Aspirants can check the latest English Test Model papers for the preparation of the Xerox Written test. Candidates can practice these questions and answers to get placed in the Xerox Organization. 1. He teaches us Grammar. A. Grammar is being taught us by him. B. We are taught Grammar by him. C. Grammar is taught to us by him. D. We are being taught Grammar by him. We are taught Grammar by him. 4. Two of my classmates come from ________ Germany. 7. It was lucky ______ they were around. All except Fox are domestic animals, while fox is a wild animal. 9. She is hopeful _____ getting that job. 11.This article tries to……… us with problems of nations so that we help them more effectively. 13. He did not/ and could not have/ understood/ the full facts of the case. D. the full facts of the case. In above article, candidates can check out the Xerox Placement papers along with Aptitude, Reasoning & Verbal Ability Model Papers. For all IT Companies placement papers candidates can refer our site www.allindiajobs.in. For more updated information, aspirants can stay tuned to our site.